I am so excited to see what people have to say about this. Bellairs novels were my absolute favorite as a child. I was really looking forward to this when it was announced, but the trailers and reviews are making me dread it now. It looks really loud and crass in a way that the book just isn't. Like, a real nightmare scenario of exactly what I wouldn't want in an adaptation. I've heard some reviewers talk glowingly about how Lewis isn't such a sad, misfit kid in this, how he's a cool, confident kid now, like they think that's a feature instead of a bug. Lewis Barnavelt is supposed to be a bookish, chubby, scared, picked-on kid who gets in over his head! If you're not gonna make Lewis Lewis, you're really not adapting the book! That vomiting pumpkin clip making the rounds makes me want to vomit like one of the pumpkins. I've heard there are farting topiary monsters too. Just, ugh. Eric Kripke gave us Supernatural so I love the guy, but if this movie is half as toxic as it sounds he'll have lost a fangirl. I've never read the book. But I will tell you it is isn't< half as scary as them hiring Eli Roth and encouraging him to scare the pants off of kids would have a person expect. It's got a bunch of clangingly lame bathroom jokes and Jack Black is typical JB madcap when the role seems to call for ambiguous/spooky. And the kid playing Lewis is a hammy Child Actor with capital letters in a way we ususally don't have to endure anymore in 2018. That said, I didnt hate it. And I hate a lot of kids movies. Cate Blanchett was wonderful and there was some thematic stuff about dealing with loss that was cool for a kids movie. It was brisk and energetic and even though Roth went at it with kid gloves more than I would have hoped, it has some spooky stuff. The SFX at the end with Jack Black with the baby body were jaw-droppingly bad. Sounds like this is the adaptation I feared it was. I haven't seen it and haven't decided whether I will but I have decided that in either case I will pretend that it is an adaptation of a different book coincidentally having the same name as the one I loved as a kid. And for the benefit of those who would rather discuss the book: previously on FanFare. When I was in grade school, we wrote letters to authors, and John Bellairs took the opportunity from some of our letters to come visit (he lived a few towns away from where I grew up). He brought a big pile of copies of his books for the classroom libraries, and I always appreciated it. I really hope this movie brings more kids to read his work, given that it's over 40 years old now. I went to see it with no previous context, and really enjoyed how they depicted magic, thought the kid playing Lewis was quite adequate as the bookish misfit outcast kid, thought Blanchett was spectacular as Florence Zimmermann to the point of being role model material, and agree that the CGI baby during the climax was disturbing and unneeded. I was also distracted by how much the actor playing Tarby looked like a de-aged Lou Diamond Phillips. My wife's been a John Bellairs fan since childhood, and had been eagerly awaiting this movie. She was absolutely satisfied with nearly everything in the adaptation save for the excesses of potty humor. She also loved Kyle MacLachlan's performance both in the flashback scenes and also when Izzard had come back from the dead. I have no familiarity with the book so I didn’t have anything to compare to. 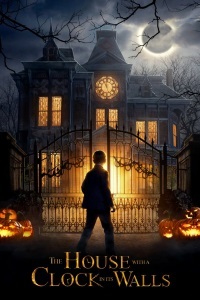 I enjoyed it, and it was great for my kid who is still pretty young but likes scary things. I don’t really understand why they changed the plot from the book (according to my Wikipedia reading of the book summary, unless it was just to give Kyle MacLachlan more screen time. Except we could have had more Renee Elise Goldberry! Please can we have more movies with Blanchett and Black!? Their chemistry was so enjoyable to watch. I'm giving most of the credit to Blanchett there. After seeing this and her similarly delightful turn as Sandra Bullock's partner-in-crime in Ocean's 8, I think she has an underutilized Dean Martin-like gift for being the right hand man whose charm is both a foil and a competitor to the lead's. Please can we have more movies with Blanchett and Black!? She shall not be dark, but beautiful and terrible as the Morning and the Night! Fair as the Sea and the Sun and the Snow upon the Mountain! Dreadful as the Storm and the Lightning! Stronger than the foundations of the earth. All shall love her and despair!